Political Party Nautanki Saala… :-P.
The anti UPA vote is splitting. The only winner in the Third front, Fourth front, Federal front game is the UPA. We will be saddled with another 5 year term of the UPA for sure. No wonder the UPA is not criticizing the various fronts that are being floated. The larger the opposition, the better it is for the UPA. No wonder BJP wants to turn it into a Presidential type of election between Fekuchand NaMoona & Pappu Pager. UPA is too smart to not fall into that trap cos if that happens, then Fekuchand will win. 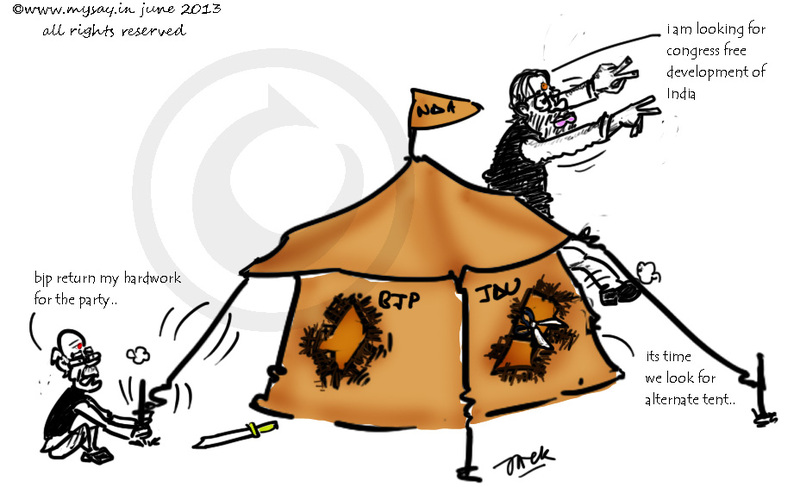 With Modi as the campaign leader / PM candidate, the BJP has ended up up as an untouchable. They are in the situation “damned you do, damned you dont”. Only morons on the social media (in a country with 12% broadband connection) think that UPA will simply roll over and die and the butcher from Gujarat will ascend the throne. The CONgress is a master at this game. Even if they get 120 seats, they will attract enough parties to run a coalation or they will prop up a Federal front / Third front just to keep the BJP out. well.. i agree with you on the fact that UPA and Congress are yet again in a win win situation .. its a pity that ..India has been befooled by so called secular forces ( who are biggest communal parties .. and 1984 riots against Sikhs after Indira’s death is the biggest example) for over 50 years in the total of 66 years on Independence .. yet those big time frauds and fekus are given opportunity to rule again and again!! hehe 🙂 lets see who really ‘develops’ India ! !